sew sew art: The Circle Quilt LIVES!!!!! December was a month to either remember or forget. Finishing up Chemo (22 days to go) and trying to do two blogs was a bit overwhelming. When I last blogged or thereabouts, I mentioned that I thought I had made enough fabric but ran out a few blocks from the end. I dyed 4 more yards of the purple which wasn't too far off from the original and I could fussy cut the pie shaped greens I needed. 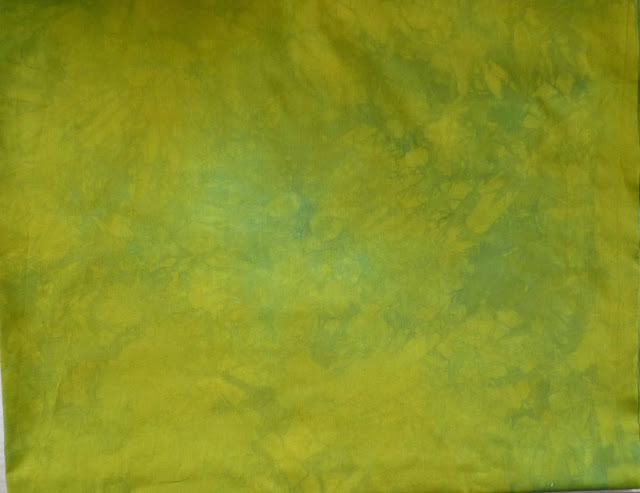 The rest of the green fabric (3 yards) was WAY too yellow. I knew I needed to over dye it but was so unsure of myself. Now let me remind you, I needed this fabric for a 2 inch border around the square of 36 circles with a 4 inch purple border outside of that. Then I would add a final binding. 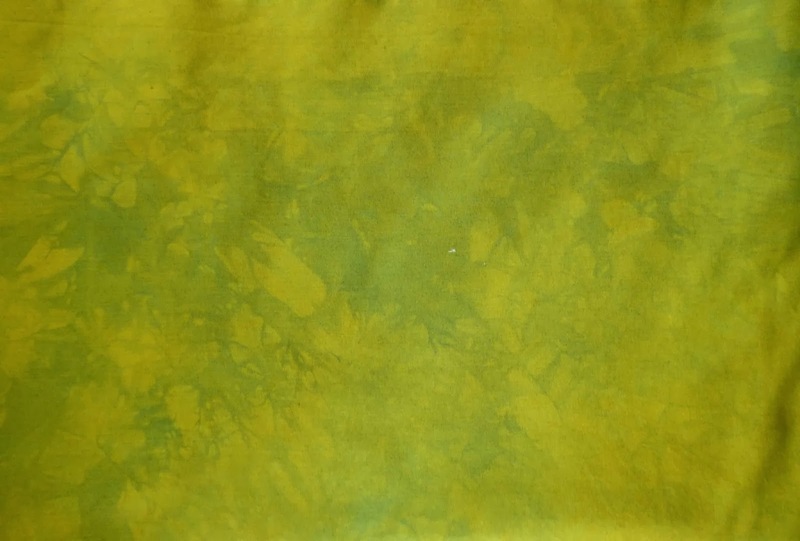 As you can see by comparing these two greens, the second fabric was WAY too yellow. I opted to make a very weak deep navy solution. I think the Universe led me to deep navy and not wanting to be overpowering lead me to a weak solution. This was tree yards of fabric and I whetted it with 3 cups of water and 3 cups of dye solution that was 3 cups water and one TBL dye concentrate (not powder). 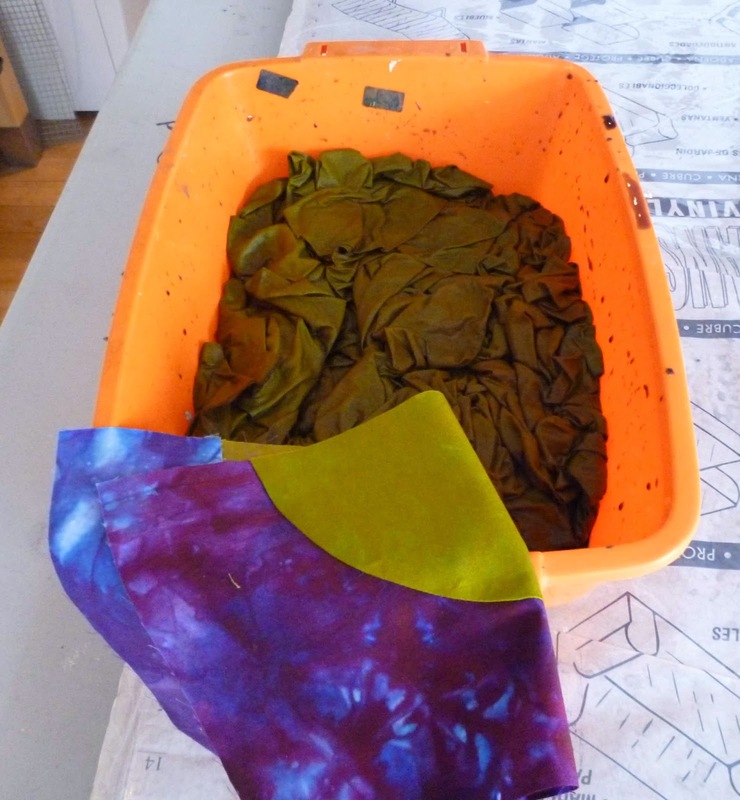 The dye concentrate was 2 TBL power to one cup of water so you can see this was VERY weak dye. Here is the fabric in the dye solution to which I later added 3 cups soda ash solution. The Navy did an amazing job of knocking back that yellow and I was loving the color. What happened next was a disaster (I thought). In my next blog post I will start to do the 1 block by 6 blocks strips with batting and backing. Each of the circles will have it's own free motion quilt design including one with my signature image!! 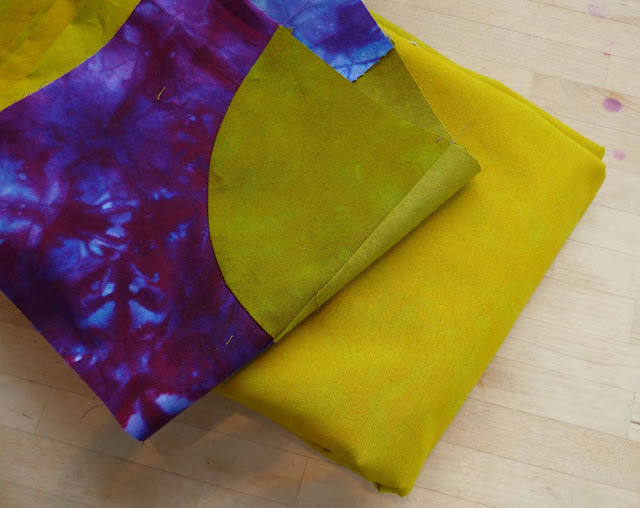 I love the outcome, and hope it blends the way you hope with the other fabrics! Serendipity is the reason I love to dye... you just never know what you are going to get, but quite often it is even better than you imagined! The green are beautiful, I love the pattern that surprised me and you. Gorgeous! So much interest and texture to it! Got to love those happy mistakes!